Had a very interesting and informative morning at Red Hot Press last weekend. 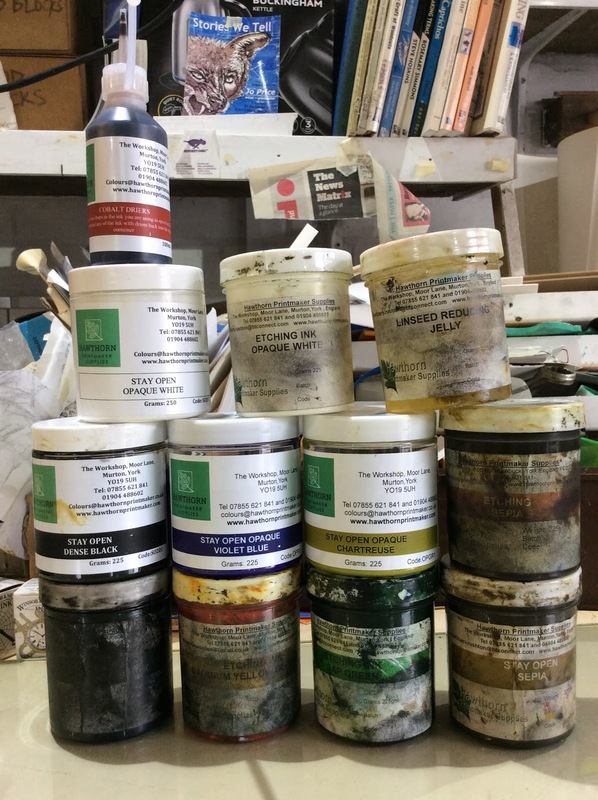 Barry and Michael from Hawthorn Printmaker Supplies travelled down from York to tell us about inks and colour mixing. Barry gave us some really good tips on how to mix colours consistently which may seem obvious but actually there’s a lot more to it than I realised. My own colour palette is quite limited (as evidenced by the photo above, though I do have some inks by other makers) and I'm not really picky about tone so it's not something I've thought too much about in the past. Barry is a fount of knowledge about the history and chemistry of ink-making. He was able to give me some advice on how to increase the longevity of the books I'm making given they are to be handled. Bought some driers to try for the monoprinting. Never needed to use it before so it will be interesting to see how it works. A very useful morning.